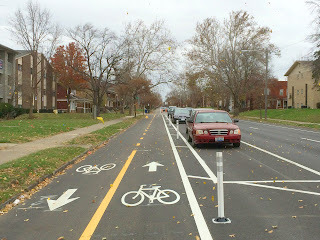 The Federal Highway Administration, Ohio Division Office, has done a review of the efforts of the State Department of Transportation (ODOT) and local metropolitan planning organizations (including Columbus) and come up with some recommendations for the State as it proceeds with its efforts to make the highway environment safer for cyclists and pedestrians. The Federal Highway Administration Ohio Division Office (Division Office) conducted a review of the bicycle and pedestrian planning efforts at the Ohio Department of Transportation (ODOT) and the Metropolitan Planning Organizations (MPOs) in the state. This review utilized the guidelines of a Quality Improvement Review (QIR) to provide some framework for the review in assessing how the bicycle and pedestrian planning efforts are administered by ODOT along with the MPOs in Ohio, and how improvements may be made accordingly. 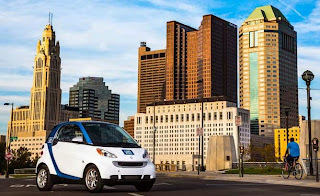 The approach of the review involved comparing the practices in the State of Ohio (from ODOT and from within all of the MPOs) against those of each of the other 50 States and certain localities nationally who engage in successful practices. ODOT should explore working with the State legislators to more clearly define multimodal options such as bicycle and pedestrian accommodations. ODOT should consider the development of a Statewide Complete Streets policy that will aid in better planning and project delivery. ODOT should consider developing a comprehensive statewide bicycle and pedestrian plan. ODOT should establish policy and procedures that would address the Districts’ roles and responsibilities in implementing and encouraging comprehensive planning for all modes statewide. ODOT should update ODOT Policy No 20-004(P) Policy on Accommodating Bicycle and Pedestrian Travel on ODOT Owned or Maintained Facilities and address the 2005 Division Office comments regarding the policy. ODOT/FHWA should develop a module of training to help transportation officials understand federal and State processes, design standards, obligations, etc. This review has succeeded in conducting an assessment of the bicycle and pedestrian planning as it relates to Program and Procedures, Roles and Responsibilities, State Laws, ODOT’s Bicycle and Pedestrian Policies Program and Practices, MPO Planning Efforts, the 2008 FHWA Ohio Division Questionnaire Results, and Safety. The Districts and the MPOs continue to demonstrate their abilities as good managers of the TE Program in terms of project delivery in addition to being good stewards of federal dollars. There is a demonstrated need to improve upon the state of the practice regarding bicycle and pedestrian planning statewide. There is also a need to continue to educate engineers and planners alike in this area. The review has identified opportunities for improvement, as well as best practices in Ohio and around the nation that can be implemented in the state. Safety for these modes of transportation is likewise important, and further improvements to reduce accidents, injuries and fatalities are called for. To address the review objective of assisting ODOT, MPOs and LPAs further develop in the area of bicycle and pedestrian planning and safety, the Division Office will meet with ODOT Central Office, Office of Local Projects and Office of Planning and select MPOs to discuss the above recommendations and determine which can feasibly be addressed, including working jointly with those offices. The Division Office will continue to offer technical assistance and will develop training that can be implemented statewide. The entire report was distributed to many locations via email, and I have a copy for our readers here. Enjoy!